Coconut water might help you lose weight if you drink it instead of higher calorie sugared drinks as part of a lower calorie diet plan. It will not miraculously make the fat disappear, however. Like all other weight loss fads that have no scientific basis, don't fall for the myth that coconut water is a weight loss magic potion. There are no properties in coconut water that will help you reduce your weight. However, if your daily diet is heavy on sodas, fruit juices and other sugared drinks, replacing them with coconut water can help you lower your calorie intake and lose weight in a healthier way. An average eight ounce glass of soda has 88 calories and 24 grams of sugar. In contrast, an eight ounce glass of coconut water, with no sugar added, has 46 calories and 6 grams of sugar. Ditch the bottles of sugared drinks, substitute them with calorie-free water and one or two glasses of coconut water and manage your calories in other healthy ways as well and you will lose weight. If you continue to drink your soda and sugared drinks and don't reduce your calorie intake in other ways, those 46 calories in a cup (8 ounces) of coconut water can add up and you will continue to gain weight. When you substitute coconut water for your suggested eight glasses of water a day, which some people do, that adds up to about 368 additional calories a day. Those calories translate to adding almost a pound to your weight every 10 days, or about three pounds a month, or 24 pounds in a year. Some people are drinking even more than 8 glasses of coconut water a day because they believe more is better, but be cautious about the amount of sodium you will get from drinking several a day. Too much salt can increase your blood pressure as well as make you retain water, which will increase your water weight. There is no scientific basis for the weight loss myth of coconut water because it has no magical nutrients or properties that will melt away calories or fat. One study published in 2006 showed that coconut water can affect metabolism in rats and lower cholesterol and other lipid levels, but there are no studies on the effect of coconut water on metabolism in humans. Coconut water contains valuable nutrients but not enough protein or micronutrients to be substituted for a healthy food choice in a sensible reduced-calorie weight loss program. One beneficial property is that it has more potassium content than Gatorade, for example, which makes it useful as a potassium replenishment fluid after moderate exercise or after a bout of diarrhea. Coconut water also contains other biologic substances including enzymes and phytohormones such as cytokinins, which are important in plant cell division and growth, but none of which have been studied for their effects on metabolism or weight loss in humans. 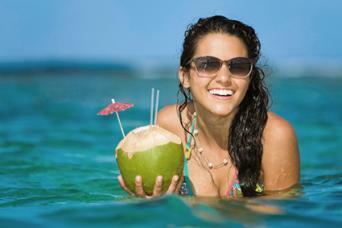 As part of a healthy diet plan, to keep yourself hydrated, enjoy a refreshing drink or two of coconut water each day. Just don't substitute it for all of your calorie-free water or a healthy food choice, or expect coconut water to perform miracles on your weight.